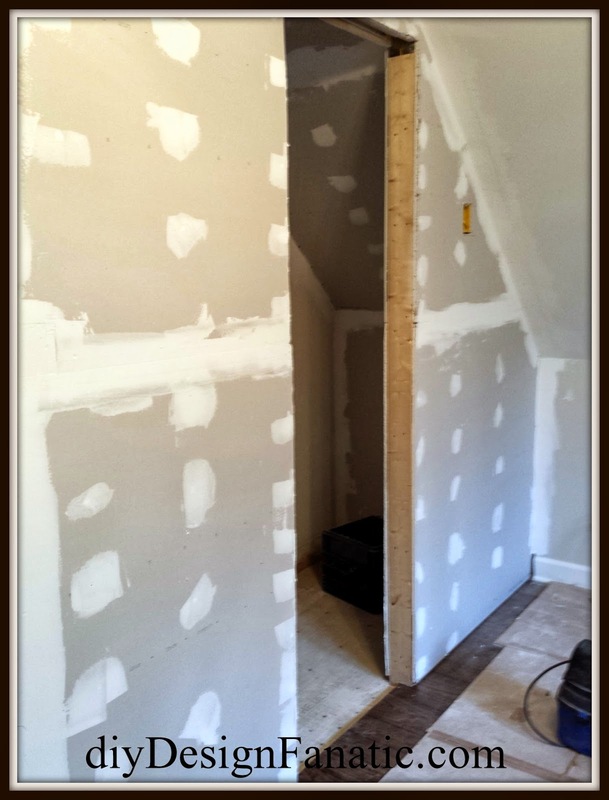 It's been a long process for us turning a closet into a bathroom, but soon we'll be adding in the (functional) design elements in our upstairs half bath at the mountain cottage. The final coat of drywall mud and the primer will be applied the next time we go! Since we've come this far, I wanted to share and give you the vision of what the tiny bathroom will look like when it's all finished. We started with a simple vision for our inspiration. 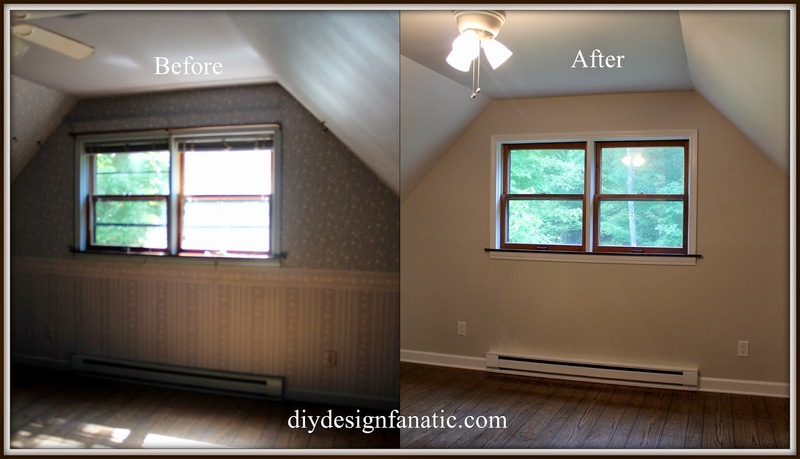 Remember way back in October we had finished taking off the wallpaper and painting the upstairs and downstairs bedroom. The upstairs bedroom looked all fresh and clean after a couple of coats of oil based primer and paint. You can read more about it HERE if you missed it. Towards the end of finishing the upstairs bedroom and after staying at the cottage for a week, we realized that it would be hazardous for us to sleep in the upstairs bedroom because we'd have to stumble down the stairs in the middle of the night should we have to go to the bathroom. So, we decided to put a very small half bath where the closet was. In order to not lose storage, the closet would go to the left of the door to the bedroom and floor to ceiling shelves would go to the right of the door on the back wall of the bathroom. This pic shows the bedroom before we started doing anything. 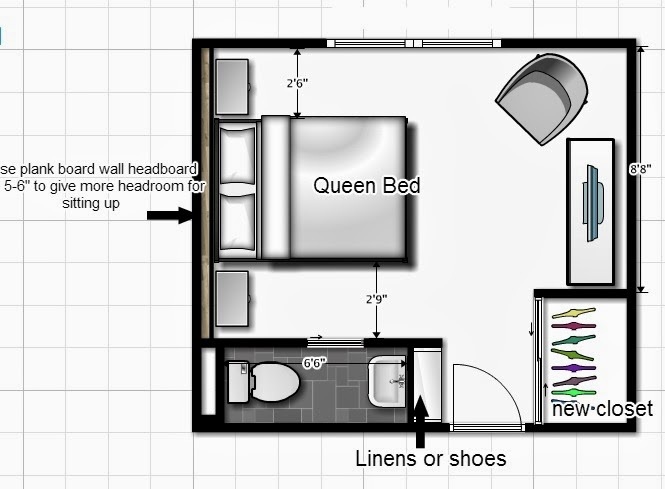 If you're thinking of turning a closet into a bathroom, ALWAYS START WITH A PLAN. Here's the plan we came up with. I call the upstairs bath "the world's smallest half bath" because it's a mere 17 square feet...with an angled ceiling on one side! 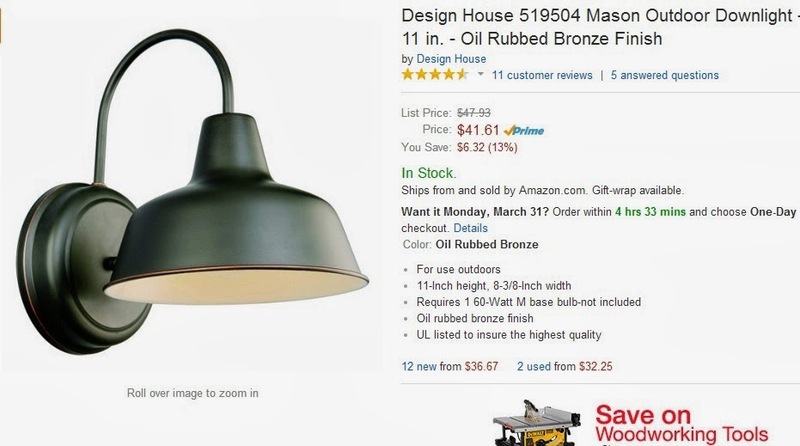 It's only 32" wide, which is the minimum to meet code. Still, it will function perfectly. A lot of planning went into this bathroom as EVERY single inch counts and affects all the elements in the room. If you look closely, you will see the empty space behind the toilet. Mr. DIY had to build out the wall so that the angled ceiling height in front of the toilet met the requirement of 6ft 8" for our state. Even though it is going to be a REALLY small bathroom, I still wanted it to be pretty like the bathroom below. The back wall will be planked and painted the same color light gray as the bedroom. The rest of the bathroom will be a bright white. Mr. DIY will be creating a custom wood countertop where it is not as deep on the sides in order to accommodate the pocket door, but it will be more arched. Instead of a cabinet below the countertop, there will be a gathered skirt to hide the pipes and bathroom storage. We will be using a drop in sink instead of a vessel sink and a single handle faucet that will be placed to the side on the counter. 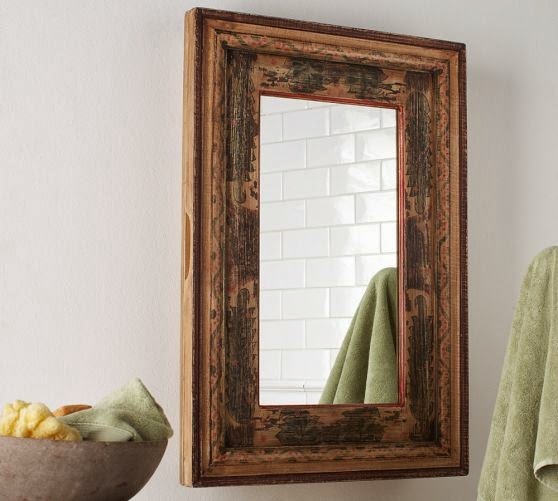 A framed wood medicine cabinet from Pottery Barn was our inspiration for the framed medicine cabinet. We chose an outdoor light to for the light above the mirror. We also chose an exhaust fan with a light in it, as well. 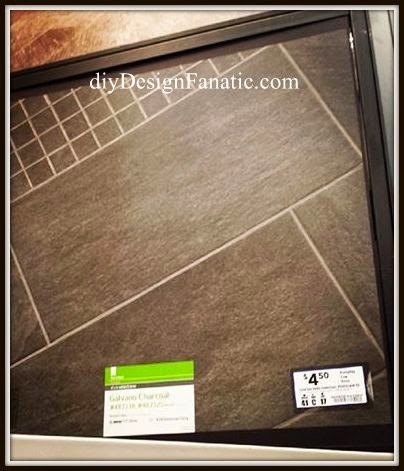 I love this large gray tile from Lowe's for both bathrooms, but it's too large for this bathroom, so Mr. DIY will be cutting it lengthwise. The cut tile will be 6" x 24" and installed in a staggered running pattern. And here's just a little peek of the world's smallest half bath so far. The angled wall is where the dual flush toilet will go. It will definitely be a water saver. The sink will go to the left of the pocket door. I'm so excited to get to this point. It's seems like it's been forever since we started, but we've been doing several projects in between (yardwork, having the driveway fixed, cutting down trees, planting trees and berries, repiping the entire house), and we didn't work on the cottage during the whole month of December. I hope I gave you a good idea of what the upstairs bathroom will look like. you can follow my Mountain Cottage board on Pinterest for more insight as to what our vision for the house is. It's going to be just so perfect Pam! I have friends who went downstairs to their bathroom for 20 years until they finally redid the one upstairs (old Victorian house)..I don't know how they did it without someone falling! It's nice to see how well you and Mr Fanatic have the same 'vision' for your projects & how well you work together. I enjoy your posts & look forward to receiving them. Thanks! Very clever and efficient use of the space, Pam. I like that you are not skimping on the decorating just because it is a small half bath. I can understand the need for it though. If I didn't have a bathroom nearby at night, I'm sure I would have to get up half a dozen times to use it! How exciting! I love your inspiration ideas! This is going to be awesome! It's going to be really pretty. I love the floor! Your husband and you make the best team! If anyone can make the "world's smallest bath" pretty and functional, it's you guys!